The Windows DevCenter has a section dedicated to the design and UI for UWP apps, with information on style, motion, layout, interactions and more. 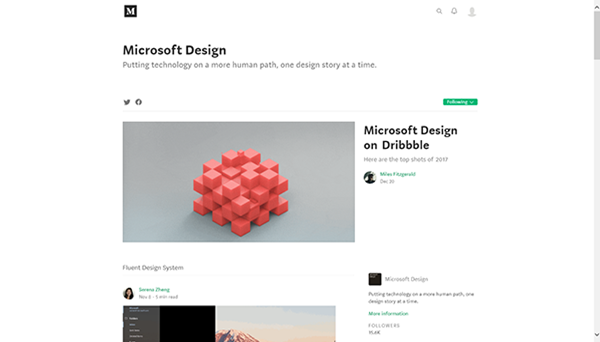 On Medium, the Microsoft Design team publishes articles more or less each month. Dribble is “a community of designers sharing screenshots of their work, process and projects”. 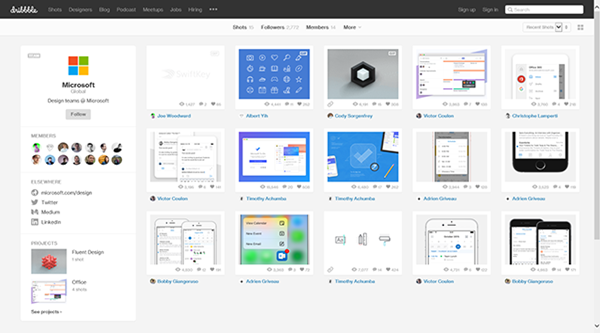 Individual Microsoft designers have been on Dribble before, but now there’s one Microsoft account showcasing all the work in one place. 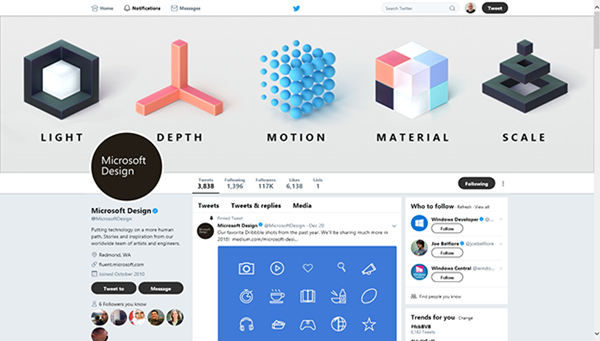 Following Microsoft Design’s twitter account doesn’t hurt – it is active, but not too much, with a post every couple of days. Shawn Wildermuth is planning a documentary about software development and asks for your support on Kickstarter. Quote: “This film explains what code is, the people who build software, and why these interesting people dedicate their lives to code and coding. […] the film's focus is demystifying software development for non-tech folks”. The list of people Shawn already has interviewed or plans to interview has familiar names in it: John Romero, Maria Klawe, Richard Campbell, Carl Franklin, Scott Hanselman, Chris Sells, Ted Neward, Barry Dorrans, Deborah Kurata, Julie Lerman, Glenn Block, John Papa, Phil Haack, James Chambers, Donna Malayeri, Joe Ficara, Kesha Williams, Sara Chipps. And there are more to come. I already backed the project, maybe you’ll do too? Am 11. 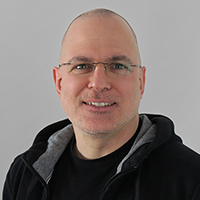 Dezember halte ich im Rahmen der GUI&DESIGN 2017 den Workshop “Von Null auf GUI - Design/UI/UX-Praxiswissen für Entwickler”. In diesem Ganztages-Workshop vermittle ich Entwicklern ohne UI/UX-Vorkenntnisse sowohl ein Grundverständnis für die Materie, als auch das notwendige Handwerkszeug für die tägliche Arbeit. Vortragsteile und praktische Übungen wechseln sich dabei ab, um das Erlernte in Einzel- und Gruppenarbeiten direkt vertiefen zu können. Emaroo caches the icons for MRU files and folders as well as the icons of executables for a faster startup. These icons change rarely, but they do change. 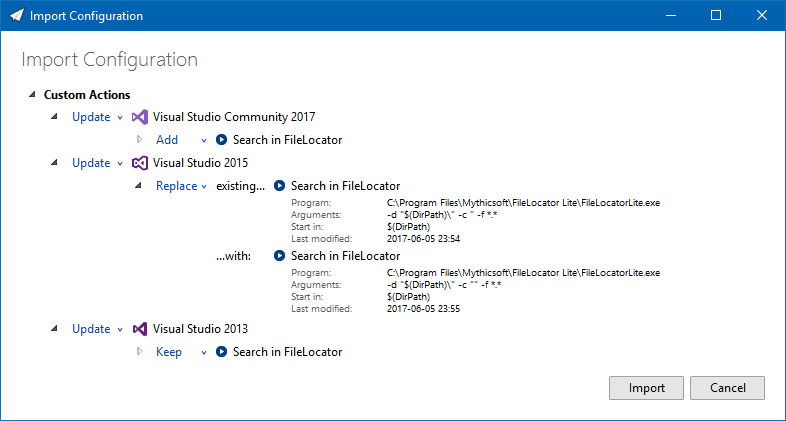 One recent example is the icon of Visual Studio Code, which was redesigned for version 1.17 and caused so much controversy, that Microsoft announced that the icon will be changed again in the future. With version 3.4.0 of Emaroo, you can clear the icon cache on the settings page (second tab from the right, “Refresh Icons” in the lower right corner). Added: Support for Photoshop/Illustrator CC 2018. Fixed: Crash that could occur if a Photoshop or Illustrator file in the MRU list was located on a SharePoint file share. This release is recommended for users of Visual Studio Code. Added: Support for the 64bit version of Visual Studio Code. Changed: Files and directories are now handled equally when it comes to copying to the clipboard: Ctrl+C copies the item (i.e. the file or directory) and Ctrl+Shift+C copies its parent directory. Fixed: Various problems with Visual Studio Code not working correctly (caused by some behind-the-scenes changes in its configuration storage). Fixed: Wrong icon used for folders if the first folder accessed by Emaroo after setup is a folder with a special icon (e.g. the Documents folder). Fixed: Collision between setting the “always open as administrator” marker and turning off UAC afterwards - the Visual Studio solution could not be opened then. A long weekend (with much more time at my hand than I originally thought) was a good opportunity to re-think the UI of the feature that has given me the most headaches in Emaroo: The import/export of configuration settings. Not all systems require the same configuration – they configurations are similar, but not the same. I make changes to the configuration in different places. I don’t want to care about making changes in a specific order and/or syncing them the configurations immediately. In Emaroo 3.0.0, the dialog for importing configurations showed (more or less) how the configuration would look like after the import – OK at first, but getting rather complex pretty fast. With Emaroo 3.1.0, the import dialog now only shows the delta between the two configurations. Visual Studio 2017 doesn’t have this custom action yet, so it should be added by default – with an option to ignore it. Visual Studio 2015 already had the action, but the imported custom action is newer, so it should replace the existing by default. 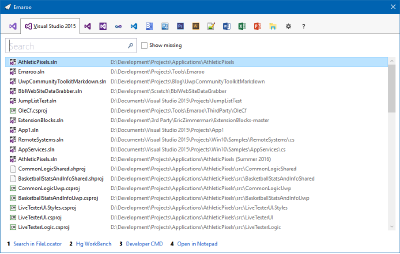 Visual Studio 2013 also had the action, but the imported custom action is older, so the default is to keep the existing custom action – with an option to choose the imported one. Looking at the screenshot one might wonder why the original solution didn’t look like this in the first place… As often the case, getting to a seemingly easy solution takes a couple of iterations. And sometimes even removing features. In this case, the import dialog in Emaroo 3.0.0 had the feature to remove parts of the configuration during import. That was possible because of the approach to show the result of the import. But possible does not necessarily mean useful. Deciding to leave out the feature opened up the opportunity to go with the delta approach, which in the end led to a better UI. Changed: Major overhaul of import dialog UI, greatly reducing complexity when importing into configurations that have many custom actions and/or installed applications. Changed: UI tweaks to export dialog. Added: Check for new version on help page (only on-demand, not performed automatically). Changed: The number of custom actions is no longer limited to 10, even though only the first 10 actions can be executed via hotkey. Removing the limit is intended to support scenarios where a larger number of custom actions exists temporarily (e.g. when trying out custom actions). Fixed: Copy/paste of custom actions didn't always change the ID when it was necessary. Fixed: Various corner cases in import/export. Added: User-defined custom actions that can be defined per-application, called via the hotkeys Ctrl+1, Ctrl+2, ... Ctrl+9, Ctrl+0. Added: Support for Visual Studio 2017. Added: Support for Word, Excel, PowerPoint 2016. Added: Support for Photoshop CC. Added: Support for Illustrator CC. Version 1.4 of the UWP Community Toolkit has been released, read more about it on the Windows Developer website and in the release notes. Images are supported (They cannot be embedded inside a hyperlink, though). Triple backticks (```) for fenced code blocks are included (without language-specific syntax highlighting, which frankly would be a bit too much to ask – but a way to implement your own would be nice). 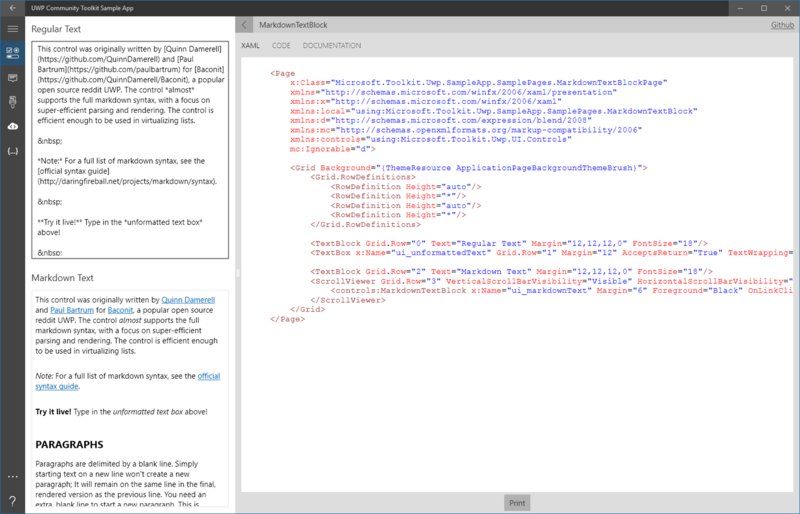 The fastest way to try out the MarkdownTextBlock (and many others controls and features) is in the UWP Community Toolkit Sample App in the Windows Store. Am 4. Mai leite ich im Rahmen der dotnet Cologne 2017 einen Workshop mit dem Titel “Von Null auf GUI - Design/UI/UX-Praxiswissen für Entwickler”. In diesem Workshop vermittle ich Entwicklern ohne UI/UX-Vorkenntnisse sowohl ein Grundverständnis für die Materie, als auch das notwendige Handwerkszeug für die tägliche Arbeit. Vortragsteile und praktische Übungen wechseln sich dabei ab, um das Erlernte in Einzel- und Gruppenarbeiten direkt vertiefen zu können. Anmeldung und Infos auf https://dotnet-cologne.de/Anmeldung.ashx. 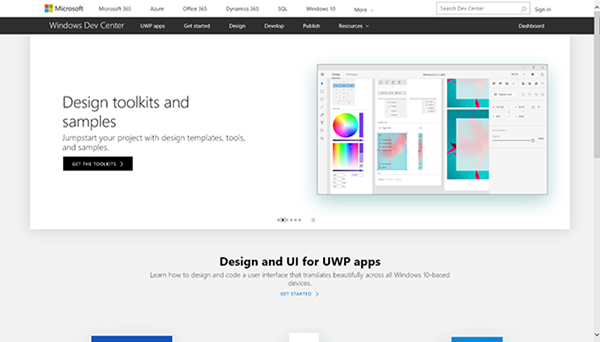 A new version of the UWP Community Toolkit has been released, this article on the Windows Developer website has the details on what’s new. One thing that caught my eye was the MarkdownTextBlock XAML Control that does exactly what the name implies: You set the Text-property with some Markdown text and it shows the rendered Markdown. You can change the styling of the output (font size, color, etc.) to match your application or a specific desired document style. And the LinkClicked event tells you when a link has been clicked. If you want to see it (and all the other toolkit features) in action, download the UWP Community Toolkit Sample App in the Windows Store. If you’ve used Markdown in more than one application or website before, you’ll know that there are smaller and larger differences here and there (the website for CommonMark has more on that). The basic features (headings, bold, italic, bulleted lists) work as expected. Images are not supported – yet; they will be in version 1.4. Tables (which are not part of the original Markdown description, by the way) don’t work. Interesting that the Markdown text in the demo app contains a non-working sample for a table. This will be fixed in version 1.4. Another Markdown extension missing are (GFM style) fenced code blocks using triple backticks – they will be added in version 1.4, but don’t expect language-specific syntax highlighting. While this list makes it sound like there are a lot of things that aren’t working (yet) or are missing, it is important to consider use cases for the control. Do you plan to display arbitrary Markdown like Readme.md files from GitHub? Or do your want a control to display explanation texts on a form (where you write all the markdown)? If the latter is the case, the control most likely will do its job already in version 1.3, with the tables and images coming in version 1.4 being a welcome addition, of course. Today, exactly ten 20 years ago, I started working at Comma Soft here in Bonn, Germany, coming straight out of university. Just amazing how fast time has gone by. Ten years at the same company is even more amazing considering the fact that I originally had planned to stay maybe one or two years, just enough to gain some professional experience, and then move on. The two TFT screens in the photo of the original blog post have been replaced by three 24” screens. My keyboard is now one without number keys (same key switches as the old one), but the desk is still the same and I’m still in the same office. I’m no longer working as a (full-time) software developer, having moved to user experience and product design. I also took on the herculean task of consolidating all documentation efforts into one single-source system (using MadCap Flare), which has both technical as well as editorial aspects. Code, graphics, concepts, words – I’m doing it all; things are definitely not getting boring here!